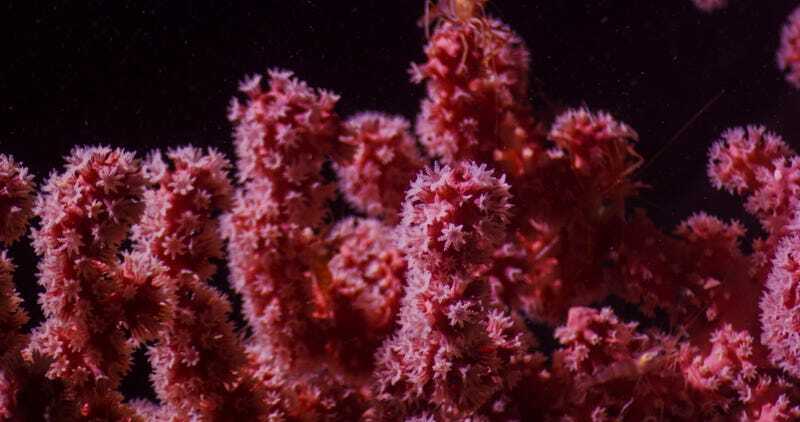 A bubblegum coral similar to the newly-discovered species. Beneath the waves some 130 miles southeast of Cape Cod, there’s a hidden world of giant canyons and extinct volcanos home to a stunning array of life forms, from sharks to sea turtles to sperm whales. Now, scientists have discovered what appear to be two new species of deep-sea corals thriving in this undersea jungle. 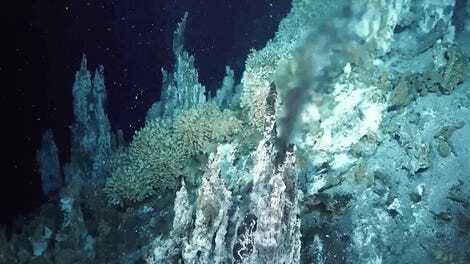 In September 2018, scientists at the Woods Hole Oceanographic Institution, with the support of Bloomberg Philanthropies and OceanX, embarked on a two-week expedition to Lydonia Canyon, one of three huge chasms located inside the Northeast Canyons and Seamounts National Monument. Using OceanX’s submarine Nadir, they traversed the ravine and collected nearly thirty samples of corals at depths down to almost 3,000 feet. An ongoing analysis of the samples in the lab has now revealed what is, likely, at least two new, genetically-distinct species of bubblegum coral, fan-shaped creatures with bundles of polyps reminiscent of wads of gum. Coral hosting shrimp in Lydonia Canyon. Unlike their shallow-water counterparts, these deep-sea corals don’t require sunlight to thrive, instead using their ring of tentacles to pull bits of organic matter out of the water, explained WHOI deep-sea biologist and expedition lead Tim Shank. Due to the difficulty accessing their habitats, these denizens of darkness remain poorly cataloged and understood. “They’re prolific, they’re diverse, and we don’t know what’s out there,” Shank told Earther. Shank and his colleagues are hoping to change that—they’re in what he described as “a race to get out there and explore” Northeast Canyons and Seamounts, the first and only marine national monument in Atlantic. Designated by former President Obama in 2016, the monument is now threatened by the Trump administration, which has been toying with the idea of revoking its designation since 2017. It’s also imperiled by garbage—Shank said that on their September expedition the team saw “a lot of plastic bags wrapped around corals”—and by climate change. The team is still analyzing the data from its recent expedition, so more findings could be forthcoming. 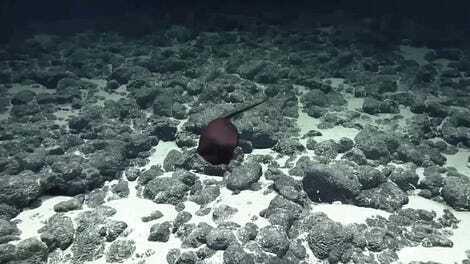 And the researchers are hoping to get out to these waters at least one more time this year. Prior to this research the monument was already known to harbor at least 54 species of deepwater corals as well as sponges and anemones, which provide spawning grounds and shelter for numerous fishes and marine invertebrates. But each new species represents an opportunity to learn more about what makes this delicate ecosystem tick. Shank explained that oftentimes, certain animals will only live in association with certain species of coral. “We want to understand how these relationships have formed and are maintained before we destroy them,” he said. The deep-diving submarine Nadir descending in Lydonia canyon in September 2018 with scientist Tim Shank inside.